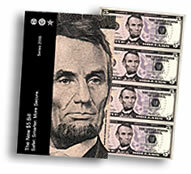 The first new redesigned Lincoln $5 bills will start arriving in banks on March 13. 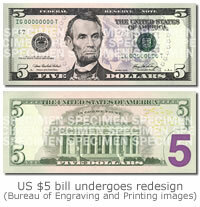 On the same day, the very first $5 note will be spent in the gift shop of President Lincoln’s Cottage at the Soldiers’ Home in Washington, D.C.
Back in September of 2007, the Bureau of Engraving and Printing (BEP) for the first time ever digitally unveiled the new bill redesign. It includes two new watermarks, an enhanced security thread and other security features that promises to make the bill “safer, smarter and more secure”. Along with the celebratory launch of the new $5 and its release into daily circulation, new $5 Uncut Currency Sheets (Series 2006 – I Prefix) will be available for purchase directly from the BEP website. The Paulson-Cabral Series 2006 $5 sheets are available in 32, 16, 8 and 4 sheet sizes and are from the Federal Reserve Bank of New York. The BEP indicates the note sheets will only be available through the Internet and their Mail Order Sales. Inflation will reduce the value of dollar so $5 bill will be replaced $5 coin. When U.S. mint will issue $5 coins for circulation? Who will be on obverse of this coin? My choice is Martin Luther King Jr.